In the past month there has been a two percentage point increase in the number of users on the traditional BlackBerry OS using OS6+ and OS7+. The growth curve still lags significantly behind that of BlackBerry 10, but there has been some consistent growth for a few months in a row now. 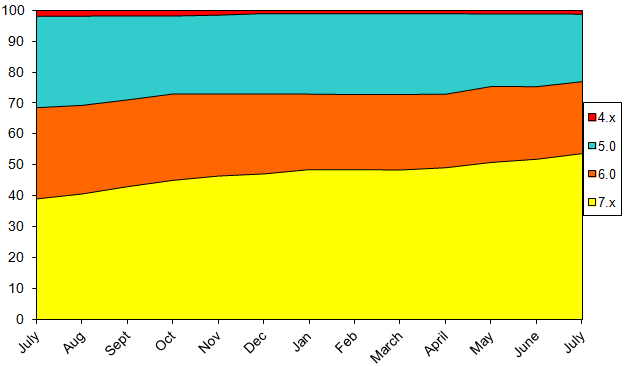 July saw 53.87% of users running BlackBerry OS 7. This data was collected by BlackBerry World for downloads of the free BlackBerry strategy game Pixelated. Data shown on the chart is from the beginning of July 2013 through the end of July 2014, and does not include BlackBerry 10 or PlayBook devices.